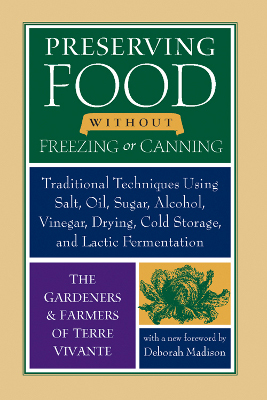 Preserving Food Without Freezing or Canning is a fascinating and thought-provoking book that has an entirely different feel from most modern homesteading books. The project started when a French gardening magazine asked its readers to share old-fashioned fruit and vegetable preservation recipes, so the resulting compilation feels a bit like an oral history turned into a cookbook. When you find a copy, I recommend that you start by flipping to the appendix, which in many ways is the most valuable part of the book. I've spent years slowly figuring out which preservation technique works best for each fruit and vegetable, and the authors of this book have created a quick tabular view of that information. For example, they show that onions are best stored whole on the shelf, but that you can also preserve them by drying, lactic fermenting, or adding vinegar. In general, the authors recommend drying fruits and lactic fermenting most vegetables --- I definitely agree with the former and might have to get over my anti-pickle sentiment enough to try the latter. In fact, after reading through the entire lactic fermentation section, I settled on Swiss chard ribs as a good starter recipe since the authors of the recipe note "Swiss chard ribs are not acidic. Our children dread lacto-fermented green beans, but they love the milder taste of Swiss chard." I'll let you know if Mark and I feel the same way once our first lactic fermentation experiment is ready at the end of August. Mom --- You're right on track --- sauerkraut is the one kind of lactofermentation that most folks are familiar with. Salt is what keeps the good bacteria outcompeting the bad bacteria in these situations, but I didn't have to add that much --- half a teaspoon for my experimental pint. having just found a recipe for carrot spears (the recipe uses baby carrots, but that season is long past here) I am going to try a jar of them, I have had fermented cukes before, they are totally different to pickled, not as sour but tangy! I don't know about doing beans like that, but I do love dilled beans, so will be doing a couple jars of those this week. But I would love to hear how the chard stems go, as I just got into eating chard, and it would be nice to have something to do with it other than steam it. 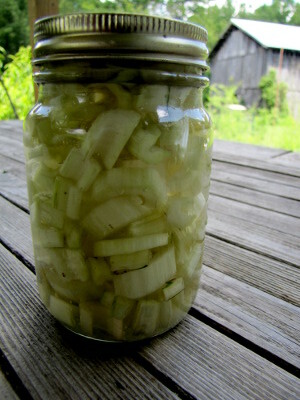 Don --- I may have to try lacto-fermented cucumbers. We really don't like pickles, but part of that is that the usual spice blend isn't up our alley. Presumably we could mess with the spices if we wanted, maybe using basil instead? I need to do some more research before trying it, though, because I don't entirely understand what I can and can't lacto-ferment without killing myself. We'll definitely post a followup about the swiss chard ribs in a few weeks! Meanwhile, you might like to try our favorite recipe --- cut the leaves up, add some green onion leaves, and saute with oil and balsamic vinegar. Yum!